Win Yushoi® Snapea™ Pamper Package worth over £50! 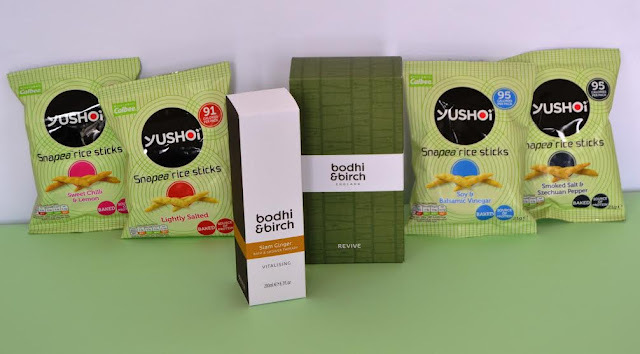 Yushoi® Snapea™ rice sticks, the new delicious baked snacks that are made using green peas and are better for you, are offering one lucky reader the chance to win a pamper package of Bodhi and Birch spa products along with some tasty snacks. The prize package, worth more than £50, is a pamper package including a Rosemary Chi bath and shower therapy and body moisturiser along with a Siam Ginger bath and shower therapy. In addition you will also find included a selection of great tasting baked snacks, which boast less than 99 calories per pack, are high in fibre and a source of protein, nut and dairy free, suitable for vegetarians and vegans and have no artificial colours or flavours, this perfect prize package is ideal for a night in alone or a fun filled evening with friends. Subtly seasoned in a range of mouth-watering flavours including Lightly Salted, Soy and Balsamic Vinegar, Smoked Salt and Szechuan Pepper and Sweet Chilli and Lemon, Yushui Snapea rice sticks are available from the brand's online store www.Yushoi.co.uk with prices starting from just 50p per 21g pack. Please note: You must at least follow/like Unique Young Mum and Yushoi® on at least one social media platform! To find out more about Yushoi®, and to view their full range of products, check out the official website here.